Available in bookstores nationwide from 11 September. The cover of this book is utterly beautiful, as is the image inside that it is based on. This is enough, before even reading the story inside, to persuade me that Paul Beavis is no one-trick pony. He is going to be around writing and illustrating imaginative, quirky books for a long time. This book carries on the story of Mrs Mo’s Monster. Once again the monster, who crunch, munched and chewed his way through his introduction in the first story, is restless. He wants to do something fun, but Mr & Mrs Mo are too busy painting the house red to do something fun. Instead of moping about wishing that somebody would play with him, our restless monster makes his own fun. He grabs a few essentials from the attic – now very well-organised, not the jumble it was in the first book – and heads for the hills. These essentials include a pair of skis, a trophy, an oar, a tennis-ball game, a kettle, a badminton racket etc… a world globe, and a torch. Dan (4) had a great time trying to identify each item in the monster’s over-stuffed pack, particularly when he began dropping things behind him. I don’t think I have ever seen a picture book that uses varied perspectives so effectively. Most of the spreads see the monster coming towards us, then on a curve in the road or bridge in front of us, then heading off in the distance. When I look back at Mrs Mo’s Monster, I can see that he has done the same thing there, but to a less noticeable degree. The flow in these spreads is gorgeous. And Beavis draws some fantastically quirky landscapes – there is something almost Seussian (or Geisel-like?) in the hill shapes. Four-year-old Dan was fascinated when I pointed out the figure proceeding after the monster as he goes along merrily dropping everything he needed. The use of shadows to preface action – as in the first book – was just perfect. The words and pictures of course marry very closely again. 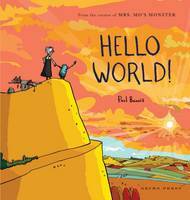 I think everybody should buy this book: forget thinly anthropomorphised bunnies and teddies, and get yourself the monster with the Mo-st. Hello World! Is all Mrs Mo’s Monster was, and more. We have two hardback copies of Hello World! to give away this week. To enter, tell us what you think the letters DBNMM could stand for – this is one of the groups of letters on the trunks shown in the attic when the monster is packing for his trip – to info@booksellers.co.nz, with the subject line “monster”. This entry was posted in Book review, Children's Books by booksellersnz. Bookmark the permalink.